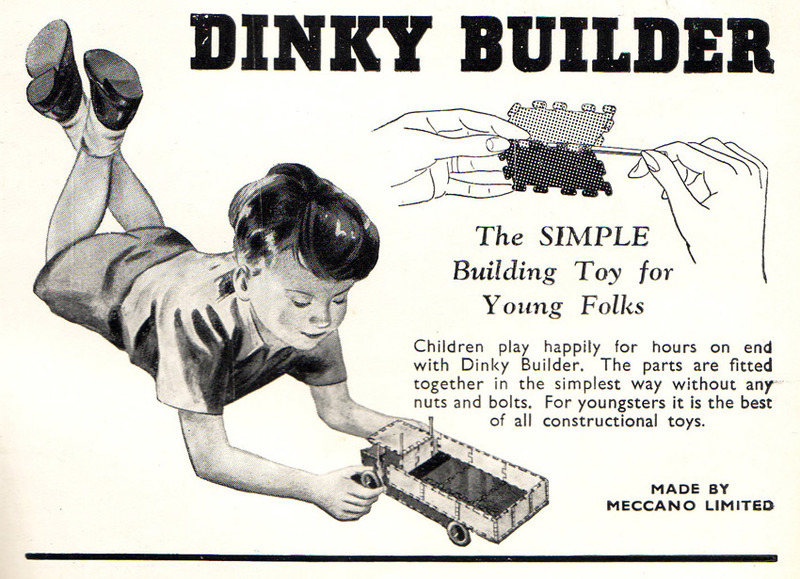 Meccano Dinky builder is one of the lesser known products produced by Meccano Ltd. . 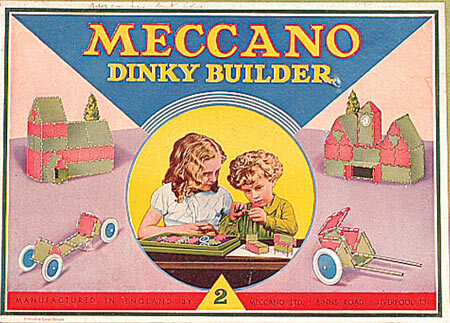 The first announcement of the product was in the December Meccano magazine just before Christmas 1934.. Meccano Dinky Builder was a construction toy aimed at younger pre-Meccano age children both girls and boys. The colourful box lid label of the 1934 Outfit number 2 is shown on the right. The parts used for building were brightly coloured enamelled, metal plates coloured: red, emerald green, salmon pink and light green. Each part has a folded edge to take a metal rod to hold the parts together in the manner of a door hinge. 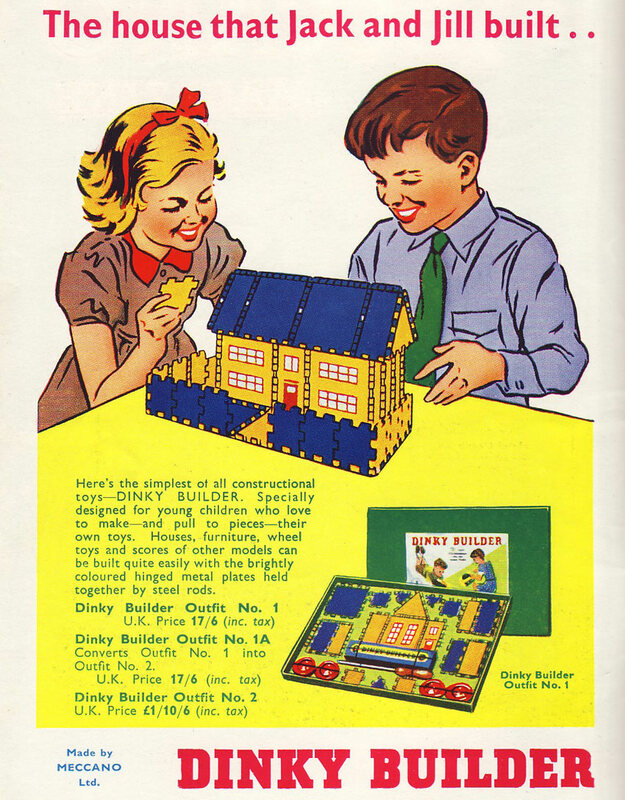 The sets enabled children to build houses , windmills, doll's house furniture, cars and lorries and were often shown in advertising with Dinky Toys also first introduced in 1934. The number 2 outfit was intended primarily to build modern design dolls house furniture and included a miniature table light operated by a battery. This set did not include any wheels. 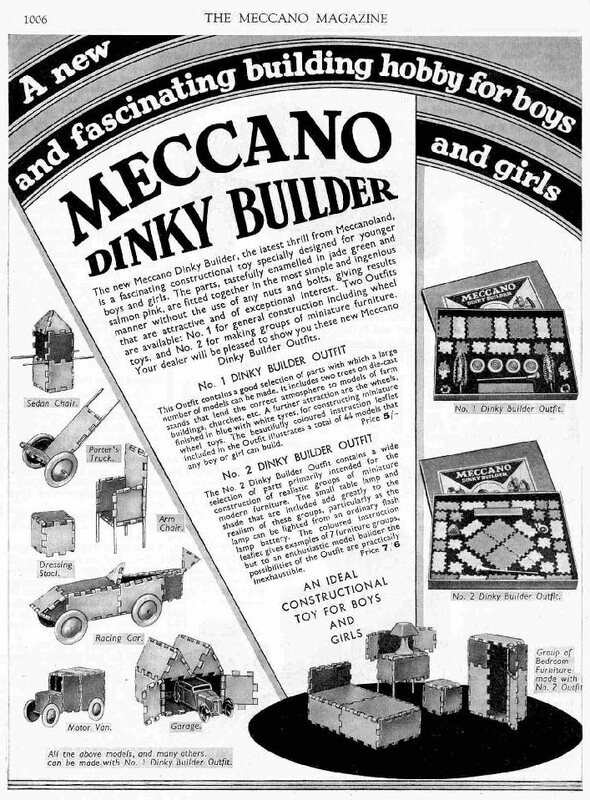 Above is an advertisement for Dinky Builder from the December 1934 Meccano magazine. In 1934 there were just two sets outfit 1 and 2 set was for building modern, doll's house furniture. In 1937 additional outfits “0” and “A” were added, set "0" was a smaller set, set “A” consisted of an assortment of parts that could be added to the other three sets, parts could also be bought individually. The sets remained in production until 1941.The No. 2 set with revised contents for 1937 is shown on the left. picture by courtesy of Tony Press . 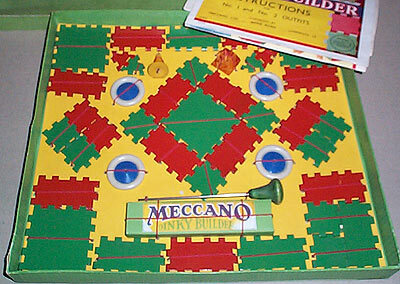 Post war Meccano was dropped from the name, the contents of the sets was also changed, there were two main sets Outfits 1 and 2 plus set 1a to convert set 1 to set 2. The colours were changed to blue and yellow and some of the parts were now decorated with windows and doors. 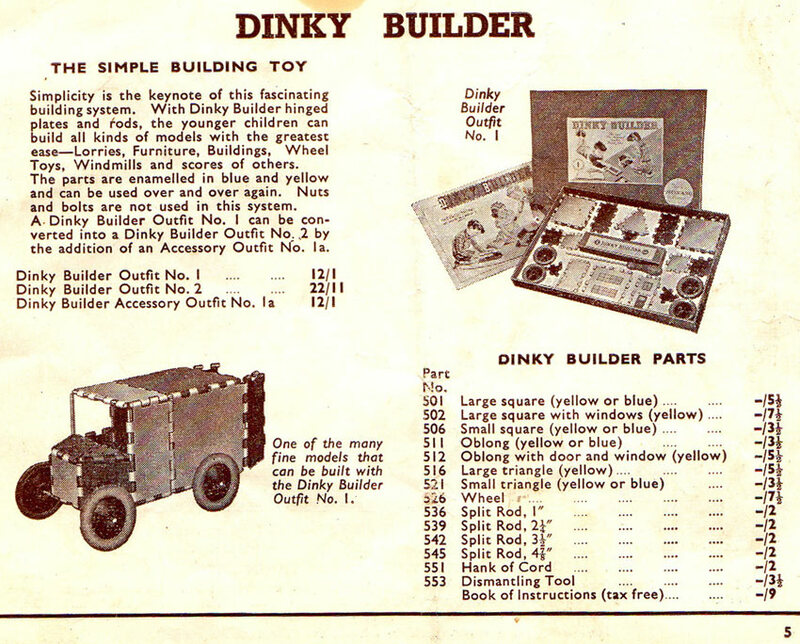 Dinky Builder page from the Meccano products catalogue of 1952. 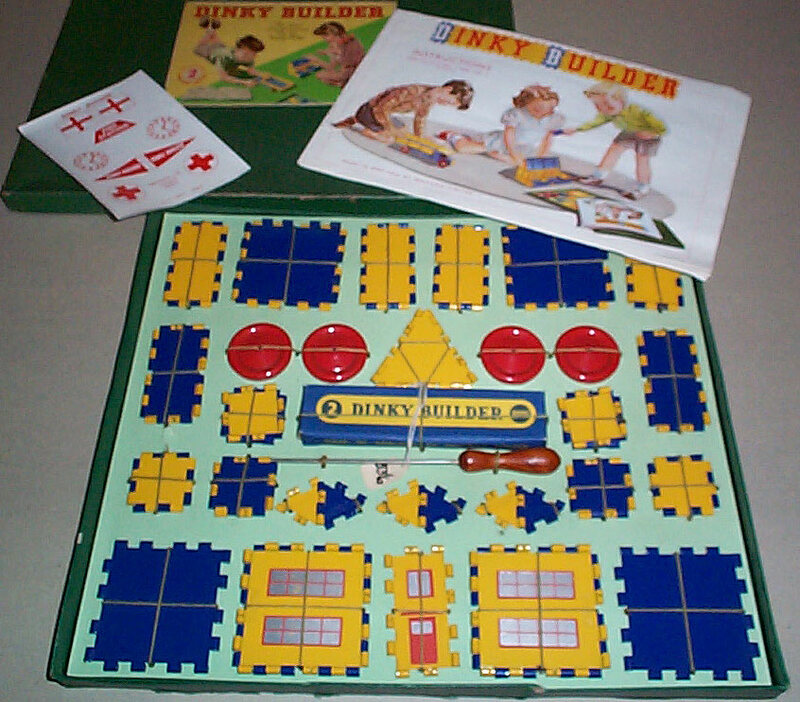 The Dinky Builder outfits were re-introduced after the second world war in 1948 and remained in production until around 1954 when they were withdrawn. They were surprisingly re-introduced in 1958 and production lingered on until around 1962, after which they were no longer listed in catalogues. By the time of their second re-introduction they were a very old fashioned toy having remained virtually unchanged in all the years of production. Perhaps Meccano continued with the sets as they were Meccano's only rival to other building systems such as Bayko, Lott's building sets, Mini-Brix and Brickplayer, all frequently advertised in the Meccano magazine. These were the days before Lego became established in the UK. 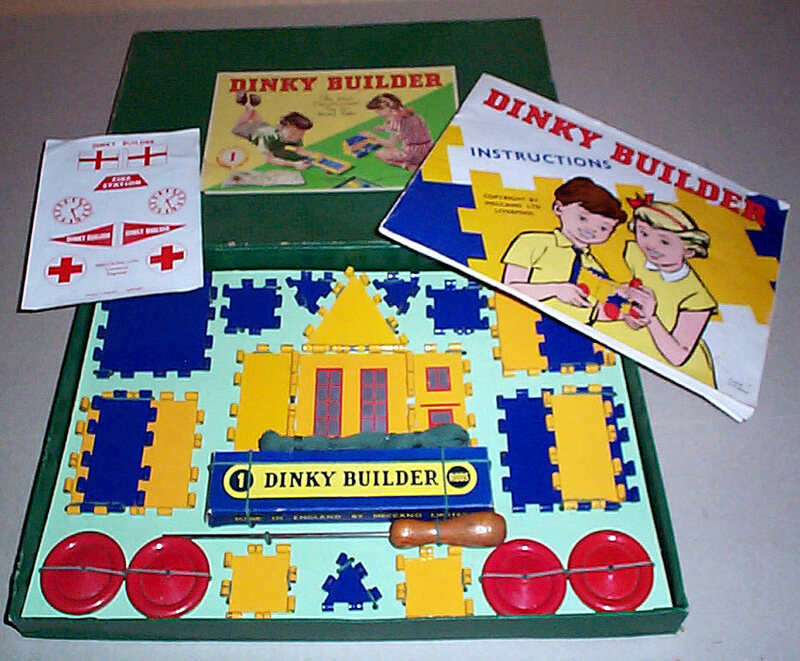 There remained stocks of the Dinky Builder sets in many toy shops for many years after they had gone out of production, as can be seen from the fine examples shown below. New advertising campaign in the Meccano magazine 1959 shown above. Above page from the 1958 Meccano products catalogue. 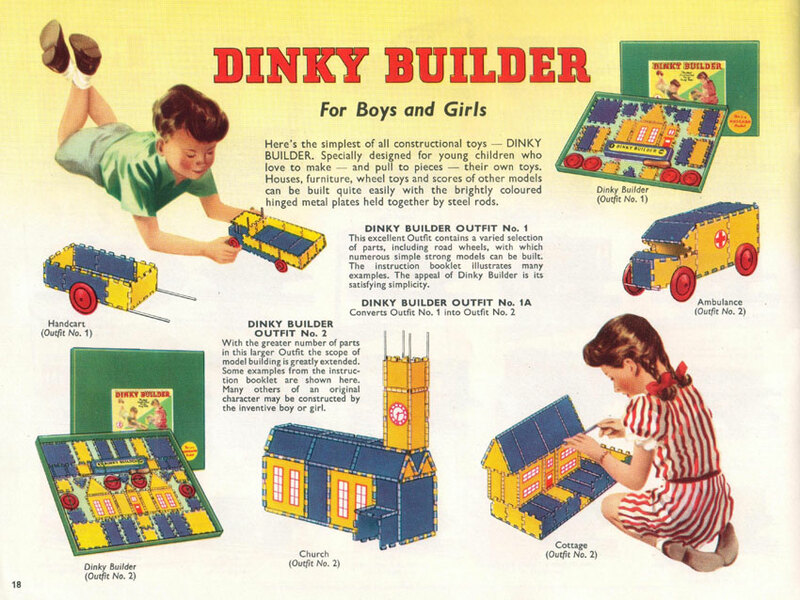 Despite its very high quality and charming advertising Dinky Builder sets never had the appeal of Meccano with children or parents. The sets are now a nostalgic memory in an age of plastic throw away toys from a time when metal toys were made to last and be passed on.